I am confident that President Rody Duterte will remain to be massively popular until his term ends. However, at the rate things are going, I regretfully predict that his international reputation in the West will be in tatters, given the Liberal Party's "excellent" working relationship with Western media and academia, thanks to its access to a massive international NGO network. Adding the fact that there's virtually no international counter-propaganda coming from the administration makes it all the worse. We're almost midway through 2018, and I have doubts on whether there's enough time to implement charter change. The President himself said in December the Nation may not be ready for Federalism, saying it is not resonating in the Visayas and Mindanao. He also said Congress is apparently unwilling to make concessions so the Federal Constitution's development appears to be on a deadlock [Star]. While I seriously hope that Federalism pushes through, let us, for the meanwhile, consider a scenario where we're still under the unedited 1987 Constitution. That is, let’s assume that there'll be a 2022 Presidential Elections. I have reason to believe that the 2022 Presidential Elections will be fiercer than 2016's. I expect international political groups to channel massive funds to help the LP candidate win. While the Omnibus Election Code prohibits foreign funding, there are many very creative ways to get around this rule. Just look at VP Leni Robredo, who received foreign funding during her 2013 Congressional Run [MT]. The case is still pending in the COMELEC, and it’s a gigantic enigma why it has been "parked” for so long. Is there practically no way she can be acquitted? But we’re digressing. Let’s get back to the 2022 Elections. In preparation for 2022, LP's perfect "Sales Pitch" could be "Help us prevent another Duterte!!!". Again, at the rate things are going, I'm pretty sure that the slogan will sell well among moneyed Westerners. But then, I highly doubt though that any LP candidate will be popular enough locally to actually win the Presidency fair and square. But you know, LP has a track record of extreme creativity. Remember Mar Roxas' futile attempt at persuading fellow presidential candidate Grace Poe to back out two days before the 2016 polls? Remember what has been happening in the VP electoral protest? The list goes on and on. FIRST, Davao City Mayor Inday Sara Duterte. Inday Sara is a reluctant candidate. In a recent sortie in Macau, she said in a speech that she can't bear being away from her little kids so she won’t run for Senate and House in 2019. However, I think there's a slight possibility that she will run in 2022. I was there in the venue, watching her speech, and I cheekily interrupted her when I said her kids would already be a bit grown up by 2022. Afterwards, I immediately asked her if she could run for President by then. She said, "Let's see." I do not want to make too much out of it, but there's a bit of a possibility there. If President Duterte manages to stay massively popular until then, Inday may become a shoo-in successor because the people will likely want continuity. The challenge, however, would be for her father to REMAIN EXTREMELY POPULAR nationwide. 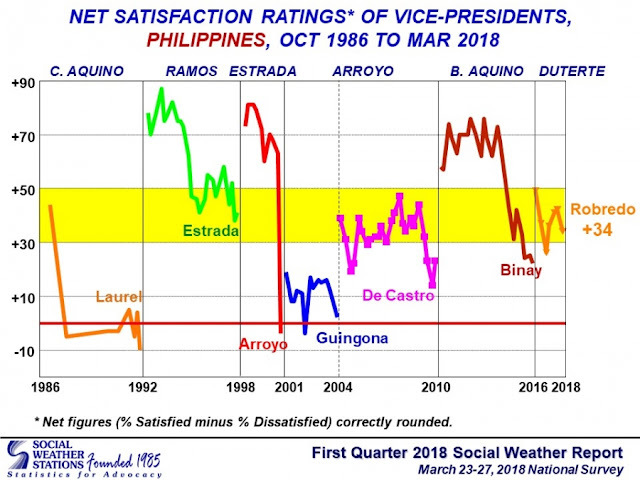 Though I personally think it’s unlikely, a massive drop in the President’s trust and satisfaction ratings in the last couple of years of his term could dash Inday’s chances. Lastly, it's also important to forecast how many Duterte supporters will support a BBM presidency, i.e. the number that will not vote for Inday. Will Duterte's support base increase over the years that he's president? Only time will tell. SECOND, former Senator Bongbong Marcos. Despite not holding a cabinet position that would’ve helped him pave the way for a potential 2022 run, the former senator amazingly manages to stay relevant to the public through his electoral protest, currently being (mis)handled(?) by the Supreme Court, sitting as the Presidential Electoral Tribunal. So far, Marcos has managed to paint himself as the underdog in the protest. Truth be told, the major delays, the wet and burned ballots, the missing audit logs, and so much more really does make him appear to be the underdog in the Public Eye. And you know, everybody loves underdogs. Truth be told, the outcome of the protest has become immaterial. If he wins, then his camp and his supporters are happy, and he gains a valuable launching pad for 2022, i.e. the Vice-presidency. If he loses or if the case never gets resolved, he will be seen as the rightful vice-president who was cheated by the Liberal Party Machinery, giving his supporters major incentive to catapult him to the presidency. The challenge to BBM's potential 2022 run is how he would expand his support base. Remember that while he received 14 million votes in 2016, many Marcos Loyalists are already of advanced age. That is, BBM has to find a way to appeal to the younger generation and possibly, find new allies who can help him get significant numbers of votes. I guess it's one of the reasons why the Liberal Party, that has a sworn hatred for the Marcoses, actively does rounds in colleges and high schools: so that they can capture BBM's much-needed audience before BBM does. Who shall I pick among the two? Obviously, many of you will ask me who I would vote for. I will not answer that. This is more of a thought experiment that should not be construed as pitting one camp against the other, a proclivity that a few supporters from both camps seemingly possess. For all we know, both may not even run at all. Anything is possible, especially in light of the past two presidential elections, where runaway candidates won: Aquino via the sympathy vote because his mom died, and Duterte, via an unconventional campaign that captured the hearts and minds of millions, blitzkrieg-style. Thus, there’s no point in fighting right now over who deserves what: there’s still four years left in Duterte’s Presidency and we don’t even know if he will last that long. For one, he even said in a closed-door meeting with journalists earlier this year that if he dies, it’s because of the CIA. But I haven't mentioned the third presidentiable yet. As you may very well notice, I completely ignored the possibility that Vice-president Leni Robredo will attempt an “upgrade”. You see, I have reason to believe that there may be some significant LP factions that will oppose her candidacy. Why? She has a proven track record of idiocy. She categorically is a dimwit. Besides, Robredo isn’t exactly very popular either, with her popularity ratings sharing the same level as VP Jojo Binay’s last two years in office, as shown in the image below. Leni's Satisfaction Ratings in her first two years closely match Binay's ratings when the latter was already under heavy attack by the administration via the Makati Parking Building Scandal, among others. Unless Robredo somehow finds a way to raise both her IQ and EQ by 50 points each over the next several months, I do not see how she can possibly become a viable opposition candidate for the 2022 presidency. Let’s go back to Bam, who faces significant challenges. Bam Aquino is ranked 10-19 in the latest Senatorial Survey [Star]. If he’s not even popular enough to definitively get into the Senate’s Top 12, how in the world will he win the Presidency, which requires so much more? In all honesty, I can see no other viable candidate among LP's ranks at the moment. That is, even if Bam may have a very slim chance at winning, he will still be forced to run because it would be thoroughly humiliating for LP to fail to field a candidate in a presidential race. But then, I do not really know how Bam will reinvent himself to make him more likeable. Well, that's his problem. But I guess he no other choice but to try. 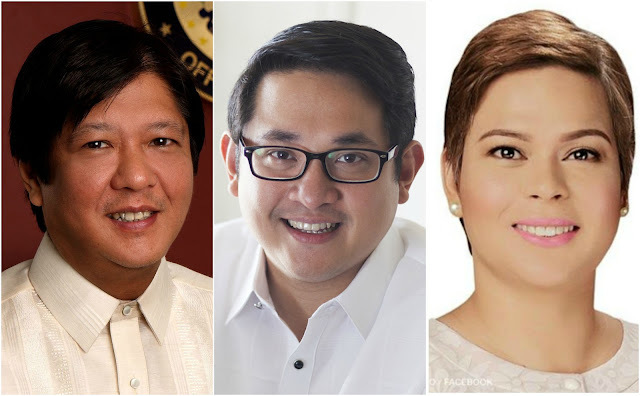 Barring the last-minute entry of another strong candidate, let’s imagine a scenario with Bam, BBM, and Inday. There’s the problem of a potential head-to-head between BBM and Inday, which could split the votes of Duterte supporters, thereby opening the possibility of another Aquino Presidency. However, if Bam remains to be as unpopular as he is today, I doubt that it’ll happen. More so if he loses his 2019 re-election bid, which would deprive him of a major platform to stay relevant until 2022. Now, assuming that Bam somehow gains a considerable level of popularity, then the possibility of Bam ending up as the runaway winner in BBM-Bam-Inday three-way becomes a significant possibility. With that said, one of the administration candidates may need to back out. Inday, I think, is the most reluctant presidentiable. While I am not exactly privy to how she personally views the Marcoses, I think that her profound dislike for the yellows, along with the calling of family life, may be enough for her to back down. But then, Inday is notoriously incorrigible: after she has made up her mind, that’s it. On the other hand, I think that the Marcoses are on some sort of quest for redemption. After being demonized for over three decades, whether justified or not, they appear to be hell-bent on redeeming their family name. I believe BBM has his eyes on 2022 and I have serious doubts that he would back down. Bongbong is already 60 years old today, so he’ll be 65 by 2022. If he backs down, the next chance would be in 2028, i.e. when he’s 71. Moreover, many Marcos loyalists are already old, so there’s a risk that he may lose a large chunk of his support base if he defers his presidential ambitions. But if BBM somehow decides that he can still defer his candidacy, then that’s it. After all, I do not know everything that’s in BBM’s mind. Will it be Inday vs Bam, BBM vs Bam, Inday vs Bam vs BBM... or even Inday vs BBM? ... then God Help Us. ...then he should expect an opposition that would be fiercer than the opposition that Pres. Duterte is facing today. Moreover, he will almost always be described as the "spitting image of his father, the Former Dictator..." and so on and so forth. However, I think BBM understands propaganda and counter-propaganda way better than the current administration, so there's a pretty good chance that he'll be able to handle it. I think his team has learned from both from recent and the not-so-distant past to know how to handle these things. ...then it will be her task to refurbish our image in the West. Inday is far more reserved and genteel than her father, and those qualities may help her accomplish the task. Another challenge would be the depth of her bench, similar to her father's conundrum when he won in 2016. President Duterte knows and trust a very limited number of people so that completing his cabinet in time for his oath-taking was an arduous task. But it's also possible that she'll know and trust more people over the next four years. But then again, remember that this is just a thought experiment. For all we know, some mayor from some far-flung city will suddenly surface in 2021 and capture the hearts and minds of millions of Filipinos, just like what Rodrigo Duterte did.